HandsFree, a recent addition to the Cydia Store, lets jailbreakers answer incoming Phone app and FaceTime calls with a wave of their hand. Better yet, the package also sets the iPhone’s speaker to be enabled automatically, allowing users to engage in a call without having to touch their smartphone at all. Sometimes you need your hands – both of them! Tasks like keeping your hands on the wheel and your eyes on the road, when cooking or washing the dishes, packing your bag, or when it’s just to (sic) cold to take of (sic) those gloves. This is where HandsFree will make your life easier. Once activated, the $0.99 package indeed uses the iPhone’s built-in proximity sensor to allow jailbreakers to answer incoming calls by waving at their smartphone’s screen. The developer promises that this feature will not drain your battery, and adds that HandsFree is also designed not to mistakingly auto-answer a call when an iPhone is taken out of its owner’s pocket. Options available to configure include how many waves of the hand it will take to answer a call, whether a wave is fast or slow, or if you’d like the speaker to be auto-enabled with the wave gesture. All of this (and more) can be configured from inside the Settings app; here, HandsFree adds a dedicated preferences pane. In order to take the new jailbreak tweak for a spin you’ll need to be running iOS 7.1 or above, and the package is compatible with the iPhone 5s, iPhone 5c, and iPhone 5 only. 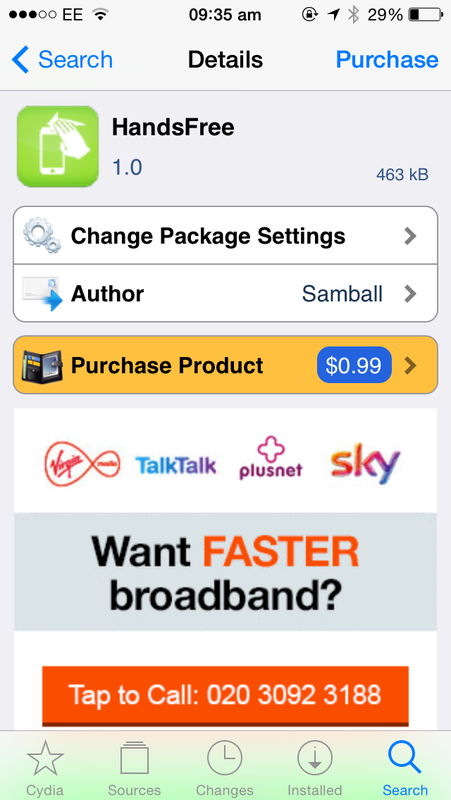 As mentioned, HandsFree can be downloaded on the Cydia Store for $0.99. Check out the new package, or see: Jay Freeman, creator of Cydia, discusses ‘Competition vs. Community’ in recent essay, Google’s Ingress global augmented reality game out now on iOS, and CloudMagic email app updated with complete mailbox access and other enhancements.